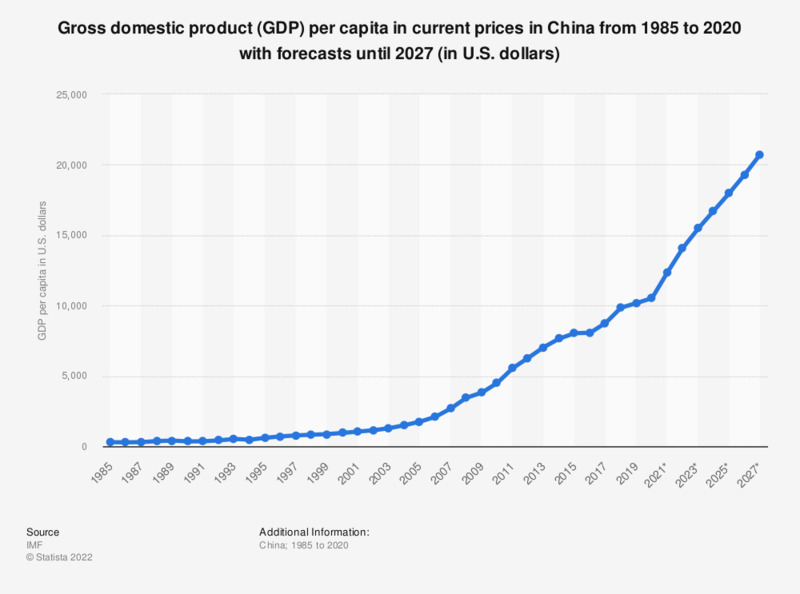 The graph shows per capita gross domestic product (GDP) in China until 2017, with forecasts until 2023. In 2017, per capita GDP ranged at around 8,643 U.S. dollars in China. That year, the overall GDP of China had amounted to 12.01 trillion U.S. dollars. Gross domestic product is a commonly-used economic indicator for measuring the state of a country’s economy. GDP is the total market value of goods and services produced in a country within a given period of time, usually a year. Per capita GDP is defined as the GDP divided by the total number of people in the country. This indicator is generally used to compare the economic prosperity of countries with varying population sizes. In 2010, China overtook Japan and became the world’s second-largest economy. As of 2012, it was the largest exporter and the second largest importer in the world. However, one reason behind its economic strength lies within its population size. China has to distribute its wealth among over 1.3 billion people. By 2014, China’s per capita GDP was only about one seventh as large as that of main industrialized countries. When compared to other emerging markets, China ranked third among BRIC countries in terms of GDP per capita, followed only by India. According to projections by the IMF, per capita GDP in China will escalate from around 3,740 U.S. dollars in 2009 to 10,586 U.S. dollars in 2019. Possible reasons for this are the soaring economy and low population growth. China’s economic structure is also undergoing changes. A major trend lies in the shift from an industry-based to a service-based economy. How important are savings of individual citizens for the development of the country?